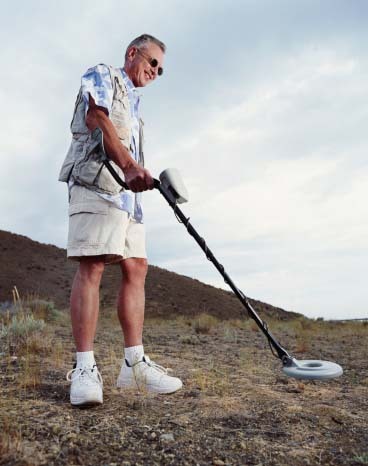 Beaches are the best places to go hunting for gold and other precious metals with a metal detector. One reason is that people often carry their precious items to the beach in bags and pockets – and items fall out. People also go swimming and lose rings, chains and bracelets. Then there is the fact that a sandy beach is one of the most difficult places to find lost items, unless you have a metal detector. Schoolyards and athletic fields. These sites are excellent places to find lost jewelry and coins, because they are visited by thousands of people every year, often in crowds. One of the best places to look for lost items is under bleachers. Spectators sit on them, items fall out of their pockets, and rings and other items that end up under bleachers can be difficult to find without the help of a metal detector. Churchyards and graveyards. Metal hunters report that they are finding a lot of old coins next to the walls that surround old churches and graveyards. In years past, people apparently lost items while sitting there. Sites of old buildings and building foundations. The sites of old houses, churches and factories can be excellent sources of old coins, industrial scrap, and many other precious metal items. Underwater locations in popular swimming lakes and streams. Items can be found in the sand and gravel right by the water’s edge. Another great place to look underwater? In and around boatyards and docks. Drainage pipes, sewers, runoffs and sluices. For example, a pipe that drains from one stream to another, or from a pond into a stream, can be an excellent place to look for metal items. So are runoffs where water spills from lakes and reservoirs. Plastic bottles and lots of other items tend to collect in these locations and so do smaller, hard-to-spot items that get carried along with the flow and deposited. Do You Need Permission to Go Hunting in These Places? To be safe, ask permission before prospecting in any of the areas listed above. Even if you are looking in a state park, it could be illegal for you to go in and start removing valuables that you find – or you could have to return them to the state. Cemeteries generally belong to churches or other religious institutions, or to the state where they are located. Even abandoned buildings on large tracts of vacant land usually belong to someone. A call to the local police department can often clear up questions about whether you can go metal hunting and whether you will own the items you find. Coins and small items of jewelry can be worth a lot more than you expect. Call Specialty Metals Smelters and Refiners at 800-426-2344 to find out how to turn your metal-detector finds into cash. Can a Drone Help You Find More Gold and Other Precious Metals? Should You Carry a Magnet When You Go Hunting for Gold?